Ahh, bacon! That crispy, chewy, salty and sinful cut of pork we all love. Depending on where in the world you live, bacon is cut from the sides, belly, or back of a pig, near the ribs. The most common form of bacon sold in the United States is side bacon. It is very fatty with long layers of fat running parallel to the rind. It’s the fattiness of the meat that makes it so yummy. 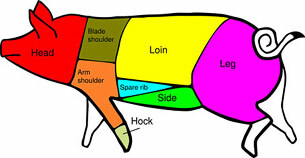 After the skin is cut away, the meat is cured, smoked, and sliced. It can be cooked in a pan on the stovetop, in the oven, or in the microwave, until it’s perfectly crisp. 1. Make a good old BLT sandwich, of course. 2. Bacon cheeseburgers will make anyone’s mouth water. Meat topped with more meat? Perfection! 3. Bacon-wrapped tater tots would go perfectly with that bacon cheeseburger! 4. Roast a bacon-wrapped turkey breast for Sunday dinner. 5. Make delicious bacon parmesan twists. 6. Add a punch of flavor to your creamed spinach recipe. 7. Make your own hot bacon dressing for a fabulous spinach salad! 8. Entertaining? Whet your guests’ appetites with the bacon-cheese fundido appetizer. 9. Indulge in a bar of dark chocolate infused with the flavor of applewood smoked bacon as a special treat. 10. Maple bacon cupcakes (made from a cake mix) look easy and mouth watering. 11. And if you liked those, try some maple bacon cookie bark. 12. It’s not real, southern cornbread unless there’s bacon grease in it. 13. Bacon lip balm anyone? 14. Join the bacon of the month club to have artisan bacon delivered to your door 12 times a year. 15. A plate full of candied bacon is very hard to resist. 16. 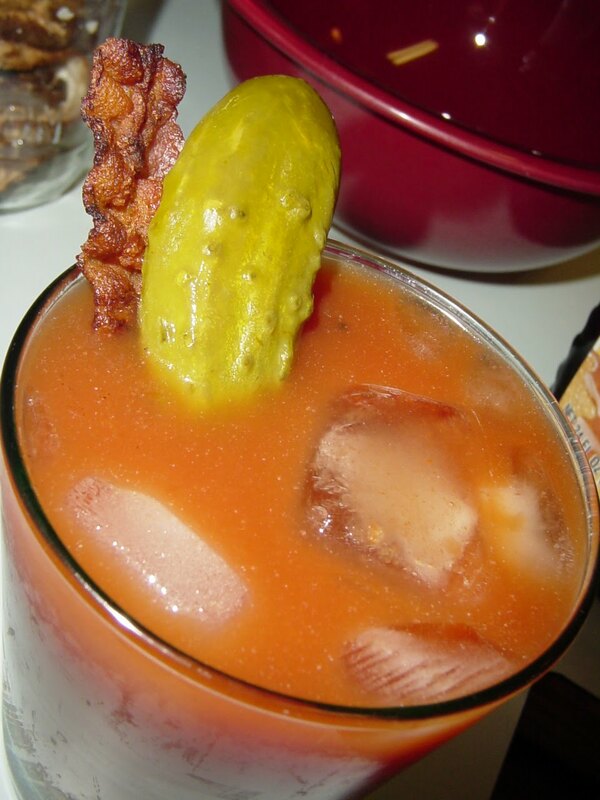 A Bacon Martini, (also known as Pig On The Rocks) is made with bacon infused vodka. 17. For a great garnish for drinks, try making a bacon swizzle stick. 18. Whip up a tasty bacon and cheese quiche for dinner. 19. Cook bacon into the shape of cups and fill with lettuce and tomato for a breadless BLT. 20. Stay warm bacon hot chocolate. 21. Bacon salt adds the flavor without the calories. 22. 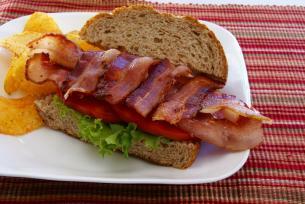 If pork-covered pork appeals to you, you may also enjoy the Grilled Bacon-Wrapped hot dogs. 23. Bacon bandaids bring back smiles. 24. Bacon wrapped Cheesy Stuffed Jalapeños will be a huge hit at your next party. 25. Top your next dinner party with these totally amazing Dark Chocolate Bacon Cupcakes. 26. Impress your guests with Bacon Wrapped Scallops. 27. A bacon-y take on an Asian favorite: bacon and bok choy potstickers. 28. Weave and bake bacon into edible placemats. 29. Then, use the woven bacon to augment your grilled cheese experience. 31. Bacon, date and almond appetizers will be the hit of your party. 32. Bacon egg salad croissants put a new spin on an old favourite. 33. Candied Bacon Ice Cream a la David Leibovitz. 34. An actual bacon bandaid clearly helps you heal faster. 35. This bacon alarm clock has been university tested. 36. Romance is in the air with this bacon bouquet. 37. With all this bacon love going on, be sure to NOT put any bacon fat down the drain. 38. Bacon popcorn is a deliciously delicious, crunchy snack! 39. For the experienced cook, try your hand at making your own bacon. 40. Baked Beans with Crispy Bacon, the name says it all. 41. Fancy up your Mac and Cheese with some bacon. 42. Potato soup with bacon sounds like the perfect soup to warm you up! 43. Strawberry bacon spinach salad will make you the star of any potluck. 44. Salty bacon is great inside an egg salad sandwich. 45. Try roasted pears with cheese and bacon. 46. Pears, bacon and cheese can also be made into a great pizza. 47. This is my favorite Bacon Quiche recipe. 48. If you are calorie cutting check out your local grocery store for turkey bacon. 50. And finally, a Bacon Fluffernutter! What an interesting list! Some of this stuff sounds bizarre, but I’ll bet it’s excellent. I followed the “Maple Bacon Cupcake” link to the blog of “Mr. BaconPants”, where I found a video called “How Cheap Bacon is Made“. While I’m not a huge fan of pre-cooked bacon, it does come in handy if you’re putting bacon in a recipe, such as meatloaf. Keeps you from having to deal with the mess cooking bacon usually leaves you with. Very impressive! I don’t eat much bacon by itself, but I love it with different foods. Thanks for linking my blog. That Bacon Cupcake is so good. I wish I could have one every morning. You could have also talked about the Harris Grill in Pittsburgh that has Free Bacon Night on Tuesdays. Starting at 6:30 you get free baskets of bacon at teh bar all night. Its a gressy good time. That’s an expensive finger food to serve up free all night, but I’ll bet it pays off. Life is better with Bacon. Well you only get about five pieces per basket and they take their time getting you another. But it’s still free bacon so I don’t complain… much. I guess there was a bar in Chicago that did the same thing… they say that’s were the got the idea. I never would have thought of bacon popcorn – sounds interesting! I love bacon! It will probably help send you to an early grave, but what a delicious way to go! Also maple/bacon lolly’s from http://www.lollyphile.com, they are delicious. Wow, so, I didn’t realize that my foray into Bacon Cupcakes (#25) was such a hot topic. Just don’t use a cup of bacon in the frosting, it’s bacon overload; oh, it is possible. Not to mention that I can’t bring ANYTHING into the office now without everyone asking me what’s in them. What a great reference!! Please feel free to visit us here (http://www.everythingbacon.com/thewetspot/index.php?
) as we seem to share your affinity for the porky crispness. Another variation on an Asian dish that I like is the Korean favourite of samgyeopsal where they use pork belly wrapped in lettuce or mint leaves. I use bacon sometimes when I am lazy to slice up the pork belly into thin slices – tastes just as great (they’re both pork anyway!). Thank you for linking to my shop! my Bacon Balm is flying off the e-shelves… I made up a batch just yesterday so if anyone wants some, shoot me an email. Forgive for the intrusion. I thought you will be happy to note that I, a vegetarian blogged aboyt this post about Bacon. Thanks Kevin! That was my laugh-out-loud moment of the day! Bacon just tastes like you are sinning! It is too good not to feel like you have to confess after indulging! Thank you soooo much for this. I don’t care if I don’t fit into my juicy couture. I love bacon so much. This is such a great list of bacon recipes. Thanks for this list! I really appreciate this! I love bacon so much! Commercial Deep Fryerso I’ll be trying some new stuff soon. I’m not sure what I’ll deep fry with bacon…but I’m sure I’ll figure out something. Texas torpedos perhaps, cheese filled jalapenos, wrapped in bacon, then deep-fried! Nice post. I love the bacon breakdown, it is one of my favorite foods and I’m bringing my daughter along so she should share my passion for bacon. OMG, outstanding list! I’ve spent an hour already reading from 1 to 21. Bacon salt martini is a mind blower. …served with fried brie and everyone is smiling! how about chocolates with chopped applewood smoked bacon in them? Not sure I needed any more excuses to enjoy bacon, but the list is much appreciated anyway! Oh, my goodness, bacon cotton candy? Is nothing sacred? When we cook chicken the first thing we do is cover the breast with fatty bacon, it keeps the bird moist and also gives extra flavor..
Wow Wow Wow! My arteries cry out!! lol! Good thing i’m good at portion control :-). I cant wait to start the experiments! I believe anything with bacon is just good. Yumm!!! I love BLTs. I remember I used to eat on every morning, even though I love southern cooking. I used to think about the BLT in the mornings and I would feel good just having one. I no longer able to get BLTs but I still make them at home. Bacon is just such a wonderful piece of pleasure! Mushrooms cooked in bacon grease…mmmmm. Not everyone appreciates it, but that’s the best use of bacon ever!